I tried three products in the Weight Watchers Morning Express Line. I'll start with the best and work down. This is an impressive product. It's easy to prepare in an enclosed microwave crisping sleeve. Best of all... it really tastes great. The scrambled eggs have a great non-microwave texture. Peppers and cheese give it a very nice Southwestern flavor. Turkey bacon is also part of the filling, but the other flavors are so prominent that you hardly notice the bacon. One of my favorite aspects of this product was the fact that the microwave crisping sleeve really works. The tortilla is pleasantly crispy along the edges. Nutritional information: Each quesadilla has 220 calories, 6 grams of total fat, 3 grams of saturated fat, 28 grams of carbs, 6 grams of dietary, 13 grams of protein, 2 grams of sugar and only trace amounts of vitamins and minerals. The Morning Express breakfast sandwiches require a little more preparation than the quesadilla. You remove them from plastic wrapping and then wrap them in paper towels. You're also instructed to microwave them, let them set in the microwave and then microwave them again. The whole process still takes less than three minutes. My microwave might run a little hot. I found using their exact cooking times, I had a lot of runny cheese on the paper towels. If I cooked for 10 seconds less than their prescribed time - for each of the cooking phases, the result was much better. The Canadian Style Bacon sandwich is rather disappointing. The whole thing is a little tough and chewy. The egg patty is tough and chewy and the English muffin is especially tough and chewy. The "Canadian bacon" adds a lot of flavor and the cheese is definitely noticeable. But it's hard to appreciate the flavors when the sandwich is almost challenging to eat. The true test of a microwavable sandwich is how little it seems like a microwave sandwich. Unfortunately, this product fails that test. It looks, feels and, for the most part, tastes like a microwave sandwich. For a better, although slightly less healthy microwavable breakfast sandwich, try Aunt Jemima's Ham, Egg & Cheese Griddlecake. Nutritional information: Each sandwich has 210 calories, 6 grams of total fat, 2.5 grams of saturated fat, 27 grams of carbs, 2 grams of dietary fiber, 4 grams of sugar, 14 grams of protein and only a minuscule smattering of vitamins and minerals. The best thing I can say about this product is that it made me appreciate the Canadian Style Bacon sandwich a little more. It suffers from all the same drawbacks as that sandwich, but has less flavor. The egg is thicker in this product and a little less chewy, but to replace "chewy" this sandwich offers "spongy". The egg has an almost synthetic texture. The cheese in the other sandwich seemed more prominent, maybe because it had more flavors to contrast with. All in all, this sandwich tastes plain. It's no way to excite your taste buds first thing in the morning. Nutritional information: Each sandwich has 210 calories, 5 grams of total fat, 2.5 grams of saturated fat, 27 grams of carbs, 2 grams of dietary fiber, 13 grams of protein, 3 grams of sugars and a teeny-tiny amount of very few vitamins and minerals. I'm giving this product line a fairly respectable rating of 5 golden eggs, based mostly on the strength of the quesadilla. The sandwiches would have each been given score between 2 and 3. The quesadilla would have received a 6. When you multiply this by our proprietary algorithm and the fact that you should try the quesadilla, the result is 5. Note: There's also a Stuffed Breakfast Sandwich in this product line that I haven't tried yet. It looks like the filling of the quesadilla in Hot Pocket. If anyone has tried it, please tell us about in the comments below. 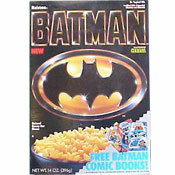 Note 2: The price below reflects a 2 for $5.00 sale for boxes of these products. What do you think of Smart Ones Morning Express? Ok, not great but it is only 5 point plus with Weight Watchers. I toast the English muffin and I put the egg and the cheese in the microwave on a plate. I bought a box of Smart Ones Morning Express Canadian bacon English muffin sandwiches when my target purchase, Jimmy Dean's Delights sandwiches, was sold out at my supermarket. The egg patty is just strange tasting - unlike the egg white-only egg patty in the Delights. The "Canadian bacon" is more like salami, and I didn't care for it at all. The cheese melts all over the place, and in order to get through the entire box, I had to microwave on 40% for 1-1/2 minutes and then turn it over for 30 seconds on high. After microwaving, to make the taste bearable, I had to add another slice of American cheese. I will definitely not be purchasing this Smart Ones product again after choking down 6 of these sandwiches in a week. The Canadian Bacon in this is awful. I prefer the one with the turkey sausage patty. I am eating the Canadian Style Bacon right now as we speak. Mine is neither soggy nor chewy. I think that the reason for letting it standing in the microwave between and after cook time is a way to let it settle and harden up a little bit. If you just nuke it real quick, of course it's going to be all soggy and chewy. The canadian bacon is staying in the sandwich just fine and there's no cheese spilling out the sides. It probably just depends on everyone's different microwaves and how picky you are. This is for the sandwich without the canadian bacon. I prepared exactly per the directions on the box. I had to let it sit for longer than the minute though, as after I let it sit for a minute in the microwave, it took an additional 4 to pick off the paper towel that had stuck to the muffin. I ended up having to use a bread knife to slice off the top of the muffin (I have high quality knives and it could barely penetrate the tough muffin exterior). The flavor was just blah and not at all worth the hassle. I'm better off buying the Thomas's 100 Calorie English Muffins, Egg Beaters, and a slice of cheese and making my own sandwich. Needless to say, I will not be getting these again. I love the Breakfast Quesidillas!! I eat one nearly every morning for breakfast and have lost 60 lbs. They taste great, and I am so not a microwaved egg fan. This is only about the Canadian Bacon Sandwich (I haven't tried the other two)... This sandwich is HORRIBLE... I microwaved exactly as the package instructed. First, nearly all of the cheese melted off of the sandwich and onto the paper towel. As for taste, this is a spongy, flavorless mess. Just no good at all. I just wanted to add regarding the Smart Ones Morning Express English Muffin Sandwich w/o Bacon. The packaging reccomends to Microwave on High for 1:20 seconds, 30 sec rest, 30 seconds High. I am fully convinced that there is some reason Microwave Breakfast Mfctrs (Jimmy Dean included) inflate their cooking times. Like Mr. Breakfast said, if you zap it the fully directed time, it turns out wrong. In my case with Jimmy Dean, it was over heated and hard, so I decided to zap these Smartones for 1:20 secs only, and they came out just right. I agree with CJ, after just having one of the SmartOnes Morning Express Sandwiches w/o the bacon. I was at the grocery store yesterday, and tempted by my old buying choices for frozen meals, tried my hand at more healthy alternatives. Normally I would go for the next available competitor to this type of Egg Muffin sandwich, the Jimmy Dean variety. Granted the Muffin is a little chewy, but not unbearable, and I sympathize with the poster who hurt himself over it. I think this could happen with any English muffin, Jimmy Deans too, just by their style. All in all, I was surprised with this sandwich (Smartones). It tasted better than I expected and without the guilt that comes with a higher fat per calorie alternative. I have tried both the egg sandwiches. I was let down in both cases. Both sandwiches are tough & chewy -- and I do think "spongy" applies here nicely. When you bite the non-meat version, you get (eventually) the bite away from the sandwich, with the meat version, the whole piece of Canadian bacon pulls out & the cheesey slab smacks you in the chin burning you. I also think the fat free cheese is far too salty. I had high hopes for this product, but I won't buy them again. I don't think you are being entirely fair to this product. It's a dietary product of course Aunt Jemima taste better it's also way higher in calories, fat, and sugar. I love these sandwiches and agree witht the above reader the one without the meat is better but I like both. 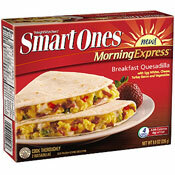 I think the Smart Ones Morning Express sandwich without the bacon is the best breakfast item offered. It's hard for people that don't want some kind of meat for breakfast to find something available that's quick, easy and great tasting.